The Palazzo Cini Gallery is a refined museum house created in 1984. It contains a significant part of the historic art collection of a leading 20th-century Italian collector: the industrialist and philanthropist Vittorio Cini (1885– 1977). The Gallery is laid out on two floors: the first recreates the charm of the patron’s residence with fascinating evidence of cultivated collecting in Venice, while the second hosts exhibitions and cultural events. The Gallery was established through a donation by Yana Cini Alliata di Montereale. 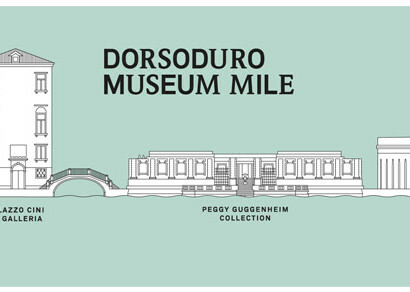 In 1981 she presented the Fondazione Giorgio Cini with part of her father’s collections and some rooms in the Palazzo Grimani, acquired by Cini with the adjacent Palazzo Foscari in 1919 and 1920. The legacy thus preserved the vital bond between the collection and the house, now re-opened to the public thanks to the support of Assicurazioni Generali. 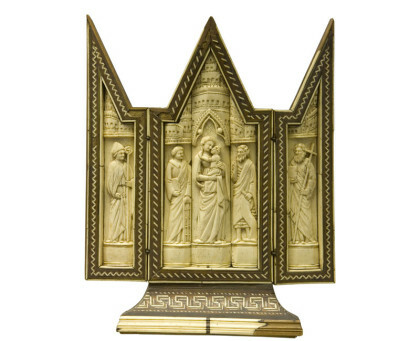 The donation consists of 13th- to 16th-century Tuscan paintings, sculptures and art objects, such as the outstanding group of Renaissance enamelled copper items, a group of Gothic ivories and the Cozzi porcelain table service laid out in the Neo-Rococo oval room, designed by Tomaso Buzzi. 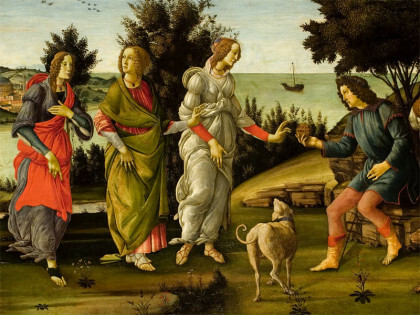 In 1989 an extraordinary collection of Ferrarese Renaissance paintings was added to the initial collection, courtesy of the Ylda Cini Guglielmi di Vulci heirs. In 2015 her heirs further enhanced the Gallery with a new group of art works and furnishings, also once in the original Vittorio Cini collection. Vittorio Cini (Ferrara, 1885 – Venice, 1977) was an entrepreneur and politician involved in the major financial and manufacturing enterprises that drove the development of 20th-century Italy. He was also one of the great 20th-century Italian art collectors. 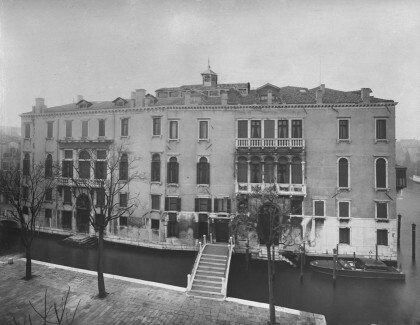 Vittorio Cini In 1919 he acquired Palazzo Foscari on the Grand Canal, built for Elisabetta Venier Foscari from 1563 to 1565, a year after his marriage to the silent film diva Lyda Borrelli. A few years later it was merged with the adjoining palace, once owned by the Santa Maria Formosa branch of the Grimani family and originally built for for Vincenzo Grimani from 1564 to 1567. In Venezia città nobilissima et singolare, Francesco Sansovino described by the Palazzo Grimani as being of a “beautiful and gracious style”. 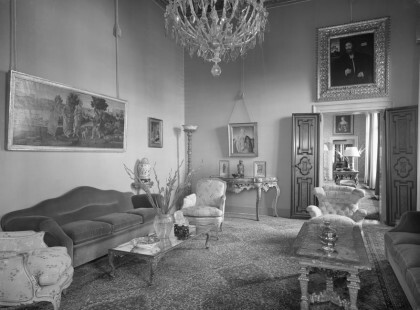 The spacious residence became increasingly important, especially due to Vittorio Cini’s need for official reception rooms, especially after he was made a Senator in 1934. And so the palace became a treasure trove of paintings, sculptures, glass works, porcelain, enamels, small bronzes, rugs and mirrors, arranged according to the principles of aristocratic elegance and care over quality so as to immediately convey the image of a wealthy, knowledgeable gentleman. Cini’s collecting spirit inspired the layout of the palazzo at San Vio, chosen to host the finest items from his immense, ever-growing collection, which by the 1940s and ‘50s had reached qualitative standards that very few similar Italian collections could rival: paintings, sculptures, glass works, porcelain, enamels, small bronzes, rugs and mirrors. Cini usually acquired these objects on the best antiquarian markets, relying on the services of a group of advisers, connoisseurs, specialists and art historians of the calibre of Bernard Berenson, Federico Zeri, Giuseppe Fiocco and Tammaro De Marinis, the leading arbiters on attributions and Italian art history culture at the time. 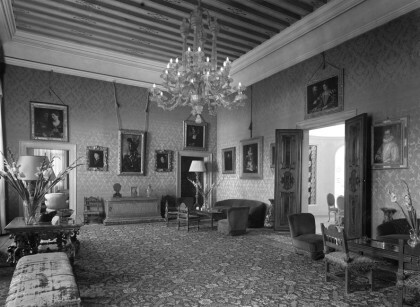 In the 1950s the collections in the palace were re-organised to improve the display of the paintings, which in the meantime had grown greatly in number. From 1956 to 1958, the Valtellinese architect Tommaso Buzzi (Sondrio, 1900 – Rapallo, 1981) – a key figure for a large clientele of aristocratic patrons wishing to modernise their private homes – was asked to design the interiors of the Cini residence in Venice. His two most significant contributions can be admired as part of the museum itinerary: the oval spiral stair and the delightful neo-Rococo oval dining room, which occupies the area of the demolished stairway to the piano nobile and showcases the splendid porcelain collection by the Venetian manufacturers Cozzi (1785-1795). As well as being a collector and man of culture, Vittorio Cini also became a patron of the arts and philanthropist. Following the tragic death in 1949 of his eldest son Giorgio, whose private plane crashed near Cannes, Vittorio commemorated him by creating the Giorgio Cini Foundation. A centre of cultural and education, the Foundation was established in 1951 on the island of San Giorgio Maggiore, which consequently hosted institutes of advanced research in humanistic studies, a technical school and a naval college. Thanks to Vittorio Cini’s patronage, the research institutes were soon enhanced with art collections, either acquired on the antiques market as specific endowments related to the academic activities (drawings, antique books and miniatures) or moved to the island of San Giorgio from the family residences. On Vittorio Cini’s death in 1977, the enormous overall collection, divided up into groups according to criteria of geographical areas and schools, passed to his daughters Yana, Ylda and Mynna. 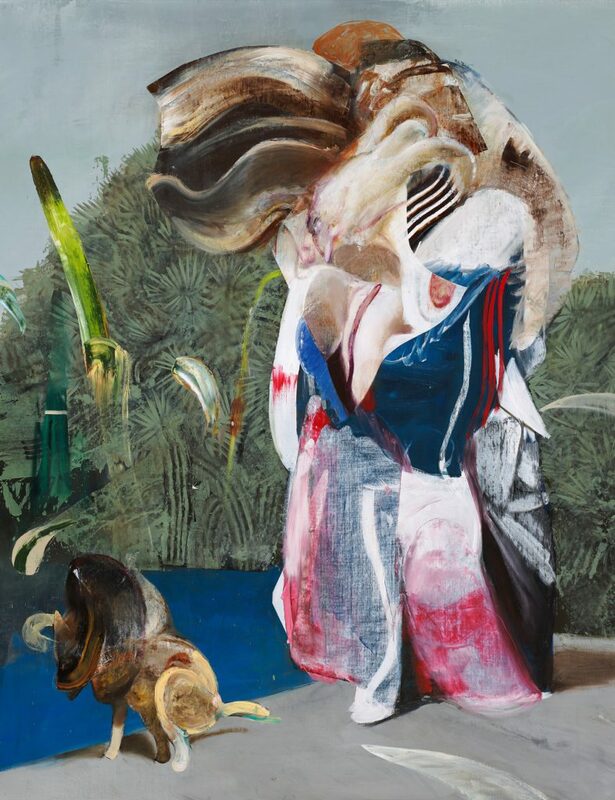 The third-born Yana, who in 1953 had married Prince Fabrizio Alliata di Montereale, inherited the section of paintings from Tuscany and Central Italy. 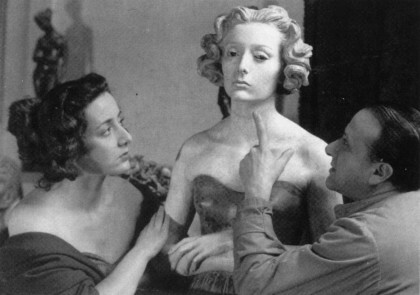 She then decided to donate a large group of them along with some fine sculptures and various items of decorative arts to the Giorgio Cini Foundation, thus laying the basis for a public gallery reflecting the great patron’s collecting spirit, taste and passion within the institution that he had created in 1951. In 1981 and 1982 the deeds of donation were drafted and they included part of the family palace. This farsighted thinking guaranteed the possibility of maintaining intact the vital bond between the art works and their setting. On 21 September 1984 the Palazzo Cini Gallery was inaugurated in a ceremony attended by Federico Zeri, who had curated the exhibition installation and edited the catalogue. This initial core was then enhanced in 1989, when the Cini Guglielmi di Vulci heirs generously permanently loaned a large collection of Ferrarese paintings. Built up by Cini by virtue of his Emilian origins and preferences, this collection had been inspired by the presence of the significant figure of Nino Barbantini, who had organised a major exhibition on Renaissance Ferrara in the Palazzo dei Diamanti in 1933. Conceived as a museum house thanks to exhibition design criteria that respected the nature of the collector’s home, the gallery exhibited the invaluable group of paintings, sculptures and art objects in a significant itinerary representing Italian art from the 13th to the 16th century. 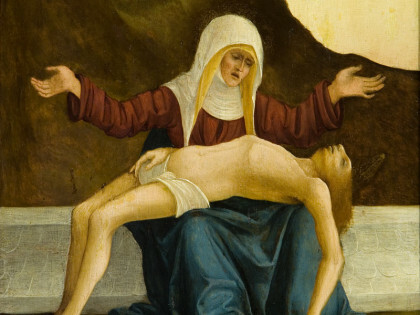 Moreover, the gallery is unique on the Venice museum scene because of its large number of “Tuscan Primitives”, which can only be rivalled by the collection in the Galleria Giorgio Franchetti at the Ca’ d’Oro. 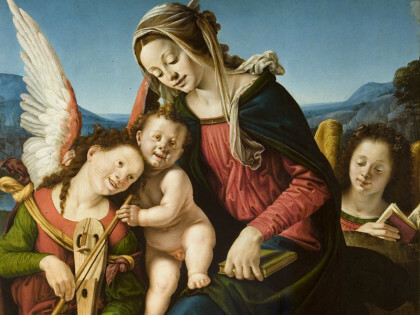 The donation included a remarkable series of paintings from Renaissance Florence, with masterpieces by Filippo Lippi, Fra Angelico, Botticelli, Piero di Cosimo and Pontormo. 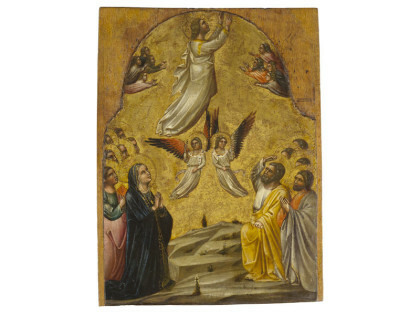 These works have been celebrated in the literature and recently exhibited to the public in a number of major international exhibitions. 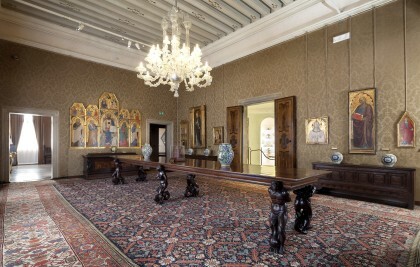 The Ferrarese Room features some of the finest items from the Estense Renaissance collection, including masterpieces by Cosmè Tura (a panel from the Colonna altarpiece), Ercole de’ Roberti − three small panels from the Griffoni Polyptych, once in the homonymous chapel of the church of San Petronio, Bologna − and works by other artists active in the “Officina ferrarese”, such as Marco Zoppo, Baldassarre d’Este, Ludovico Mazzolino and Lorenzo Costa. The highlight of the series, however, is the panel with an Allegorical Scene by Dosso Dossi, once part of the ceiling in Alfonso I d’Este’s bedroom in the Estense Castle, Ferrara. 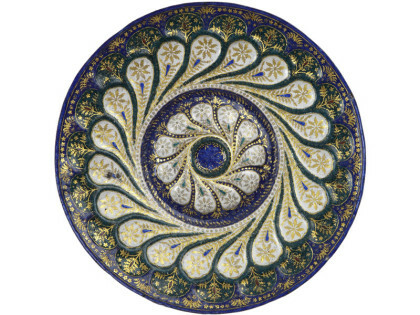 The collection of paintings is complemented by various groups of decorative arts of very fine workmanship: French, German and Sicilian-Byzantine ivories; four bone artefacts with wooden inlays made by the Workshop of the Embriachi; the admirable series of Renaissance enamelled copper objects made in Venice; a 13th-century Limousin champlevé enamel pyx; the stunning 18th-century Cozzi hard-paste porcelain table service; not to mention cassoni and furnishings, including an 18th-century Rococo Neapolitan sedan chair. All testify to the depth and vast range of the great Ferrarese collector’s interests. Overlooking the Campo San Vio, this spacious sala is one of the most sumptuous rooms in the palace. Before the death of Count Cini and the conversion of the residence into a museum, it housed a rich collection of Renaissance portraits. Conceived by Cini as a reception room and embellished by glass and porcelain objects, it was the ideal place for “art luncheons” – meetings with art historian and antiquarian friends, during which they discussed potential acquisitions to enrich the collection. 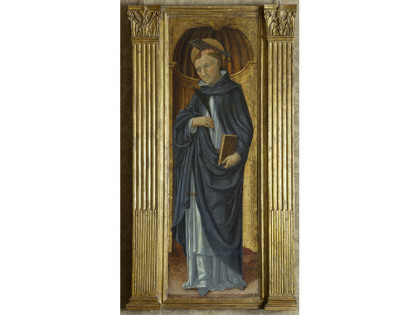 The room is characterised by the presence of two large polyptych altarpieces, significant examples of Tuscan figurative art from the late 14th to early 15th century, and an interesting series of paintings with gold backgrounds from the Sienese Quattrocento. The adjoining room is a luminous small oval drawing-room, designed by Tomaso Buzzi, containing an 18th-century porcelain table service made by the Venetian manufacturers Cozzi. The room featuring Tuscan Renaissance masterpieces, for which the Palazzo Cini is rightfully renowned, was used by Vittorio Cini as a small drawing room for illustrious guests and so even in his day it was adorned with some of the best paintings in the collection. The current exhibition installation still reflects the original feel of the room thanks to Princess Yana Cini Alliata di Montereale, who presented the Foundation with many of the valuable works still on show here, such the Judgement of Paris by Botticelli and his workshop, a Madonna and Child by Piero della Francesca and Piero di Cosimo’s magnificent Virgin and Child with Two Angels. 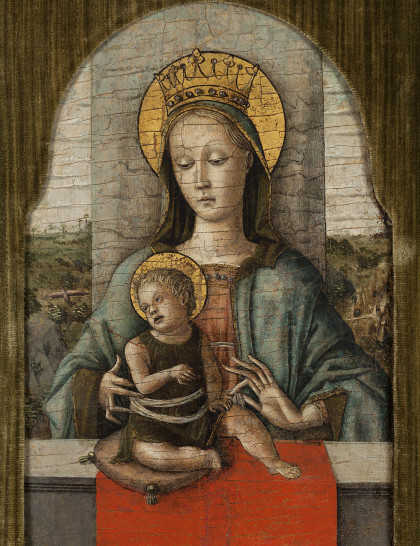 Cini’s predilection for the Renaissance is demonstrated not only by the presence in the collection of paintings on panel from a broad geographical area mainly comprising Tuscany and the Veneto (Crivelli, Montagna, Bellini and Cima da Conegliano). 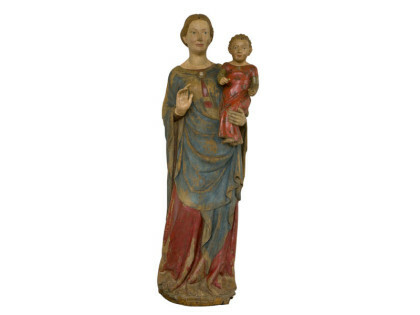 There are also Renaissance works from Ferrara, Romagna and southern Italy (Antonello da Messina and Colantonio), as well as large group of 15th-century wooden statues and polychrome terracotta works attributed to the workshops of Ghiberti, Donatello and Jacopo della Quercia, plus items by Luca della Robbia, small bronzes and ceramic objects. 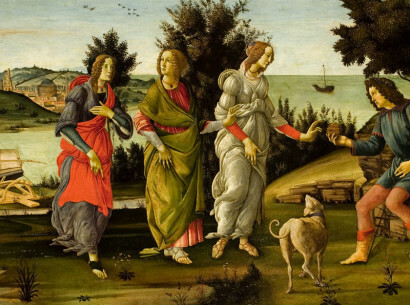 The works were acquired from the usual reliable antiquarian sources and private aristocratic collections, such as those belonging to the Dukes of Torlonia in Rome (the painting by Piero della Francesca), the Caregiani Counts in Venice (Domenico Ghirlandaio’s roundel), the Guicciardini Counts in Florence (their collection once included the supreme Cini Gallery masterpiece – the Portrait of Two Friends by Pontormo). This is the only room with a wall decoration: a 16th-century grotesque-motif frieze runs round the room beneath the ceiling. An interesting vestige of the Palazzo Grimani, the frieze was spared when almost all the other walls now in the gallery were covered by a damask fabric. 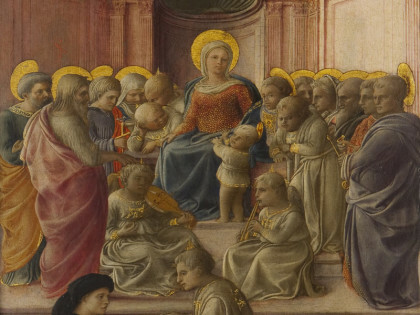 This room contains a precious collection dedicated to the Ferrara Renaissance with representative works from the leading artists at the Estense court in the 15th century. Vittorio Cini, who was born in Ferrara, commissioned Nino Barbantini to organise the collections in the palace on the Grand Canal and to refurnish Monselice Castle. 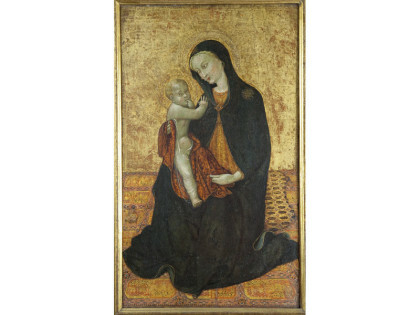 An ingenious, indefatigable critic and expert “museologist”, Barbantini had curated a memorable exhibition on the Ferrara Renaissance at the Palazzo dei Diamanti in 1933 and it was thanks to his constant presence and suggestions that the works from the Estense Renaissance school have such a prominent place in the overall Cini collection. 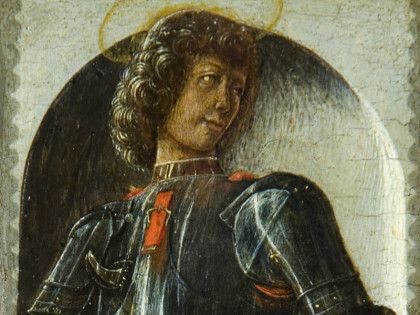 The gallery not only features masterpieces by Tura, De’ Roberti, Dosso Dossi and Mazzolino, exhibited here thanks to the generosity of the Cini Guglielmi di Vulci family, but also other Ferrarese works still in the possession of the heirs. 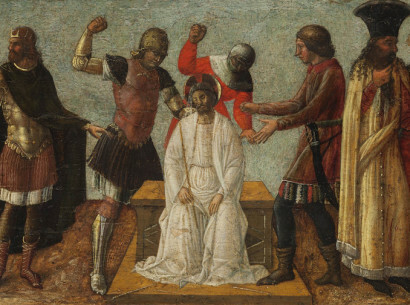 They include paintings by the Master of the Twelve Apostles, Garofalo, Panetti, Girolamo da Carpi and Scarsellino. In the 1950s the architect Tomaso Buzzi (Sondrio, 1900 – Rapallo, 1981) was asked to redesign the interiors of the Cini residence. A key figure for a large clientele of aristocratic patrons wishing to modernise their private homes (Volpi di Misurata, Papadopoli, De Lazara Pisani, Contini Bonacossi and Visconti di Modrone), Buzzi worked for Cini on several occasions, offering his creative flair as early as 1938, when he was responsible for the restoration of the castle at Monselice. The hanging gardens, staircases, terraces and ponds that he designed for the castle look to the tradition of the Venetian villa and already show signs of what was to become his neo-Mannerist style. 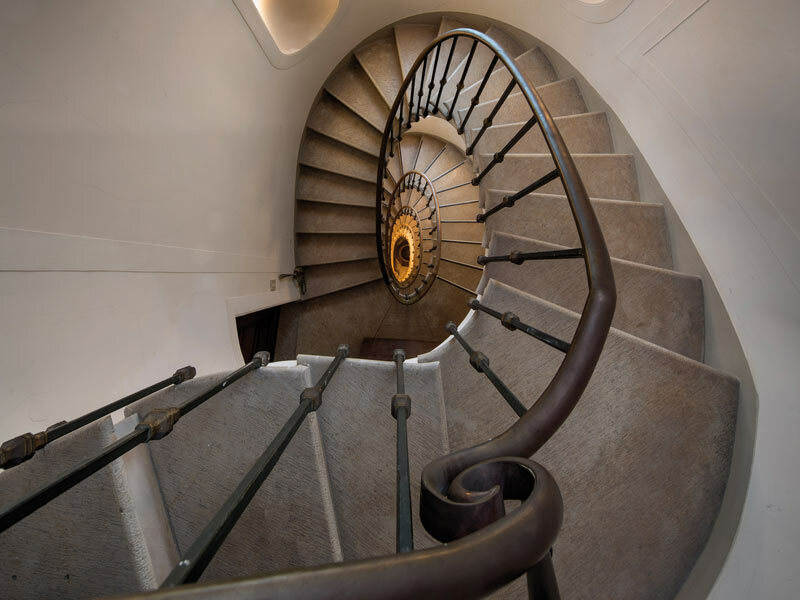 One of Buzzi’s most significant contributions to the Palazzo Cini can be admired on the museum itinerary: a striking oval spiral stair, with its explicit allusions to illustrious models, such as the scala regia in the Palazzo Farnese at Caprarola del Vignola, Palladio’s oval spiral stair in the monastery of Santa Maria della Carità, Venice and Borromini’s “helical stair” in Palazzo Barberini, Rome. The visit begins in the antechamber to the apartment. This small room is typical of Vittorio Cini’s refined taste in the decorative art, which always exercised a strong attraction over him, as the abundance and variety of decorative objects in the collection demonstrate. 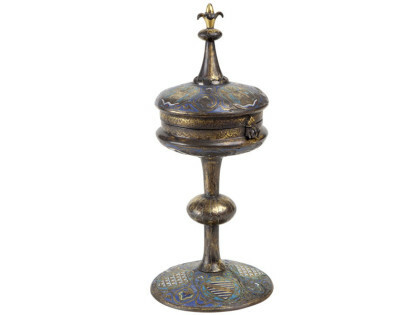 Glancing through the collection inventories, we find numerous ivories, enamels, silver objects, small bronzes, intaglio gems, cameos, glass works and jewels. 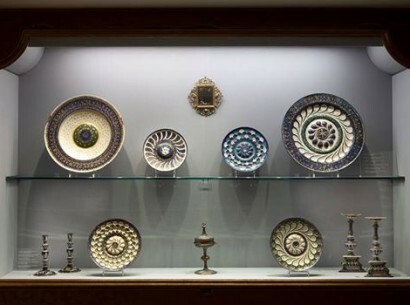 This shows his interest in small precious objects: some were put away in various corners and then brought out to be shown to connoisseurs and enthusiasts, while other were elegantly set out on small tables, consoles, shelves and glass cases, as is revealed by period photographs. 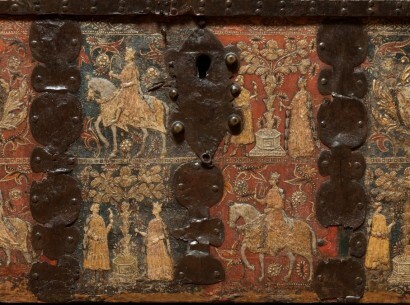 The sample from this very rich collection exhibited here features groups of beautiful Mediaeval ivories and Renaissance enamels. 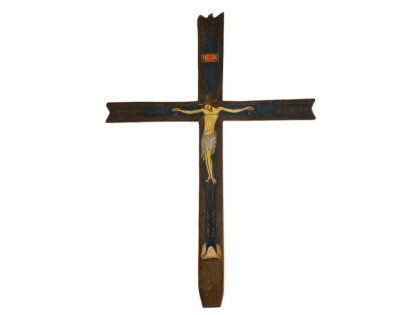 The Antechamber is also adorned by a series of paintings by the Tuscan school, including a 13th-century masterpiece: the processional cross by Giunta Pisano, the highest standard work acquired by Vittorio Cini in the category of the “Italian Primitives”. Until 1937 it had belonged to the Piedmont collector Riccardo Gualino. The room has the intimate warm feel of a formerly inhabited home thanks to the presence of a console with intaglio rocaille scrolls and an 18th-century Neapolitan sedan chair. The second room in the gallery effectively illustrates Vittorio Cini’s collecting passion for the painting of the Italian “Primitives”, a term coined in the 19th century for those artists who were active just before the great turning point of the full Renaissance, mainly identified with the genius of Raphael. 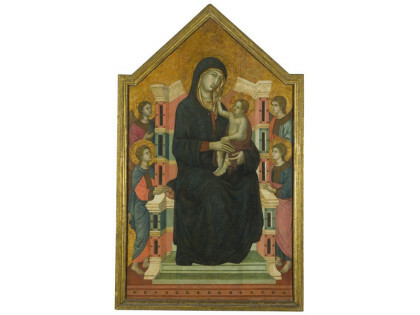 In the first half of the 20th century many collectors in Vittorio Cini’s generation had a deep interest in painting on panel and works with gilded backgrounds from the 13th to the 15th century. This keen interest was directly proportional to the relatively abundant supply of works on the antiquarian market. 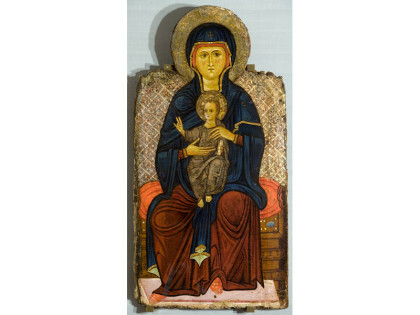 Hundreds of complete works but also often dismembered pieces from churches, monasteries and confraternities thus considerably enhanced collections, thanks also to the brokering of numerous merchants, agents and restorers. 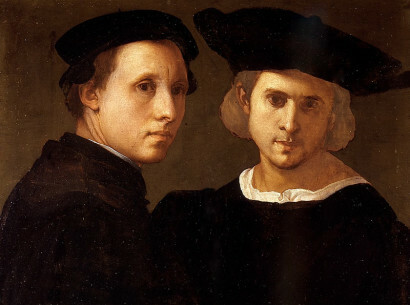 Vittorio Cini’s most influential advisors, capable of cultivating his taste and shaping his choices, included exceptional art historians and connoisseurs, such as Bernard Berenson and Federico Zeri, whose studies and aesthetic preferences for Trecento and Quattrocento painting, especially in Tuscany and Central Italy, conditioned the nature of the collection, which became one of the most important of its kind in the 20th century. This room containing paintings, sculptures and cassoni, is embellished by a 19th-century moulded Murano blown glass chandelier and a delicate neo-Rococo ceiling, made by Giacinto Boccanegra’s team of stucco artists when the palace was being renovated by the architect Tomaso Buzzi. 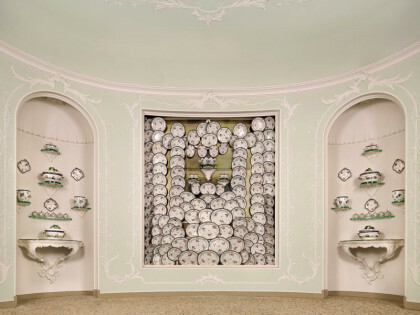 In the late 1950s Tomaso Buzzi designed this charming room for Vittorio Cini to showcase an 18th-century porcelain table service made by the Venetian manufacturers Cozzi between 1785 and 1795 and consisting of as many as 275 pieces. A fascinating setting in “period” style, the room was used by the Count as a small dining-room with a table for eight. The overall style of the room – with its delicate white vegetable stucco motifs patterning the ceiling – was inspired by the fleshy scrolls decorating the Cozzi plates, cachepots and glassware, which are halfway between late rocaille models and Neoclassical patterns. The celebrated manufacturers, established in Venice in 1764 by Geminiano Cozzi from Modena was active until the fall of the Serenissima Republic. Their vast production boasted table crockery, coffee, tea and drinking-chocolate sets, spice jars, and statuettes inspired by the fashion for chinoiseries, all made with very refined hard-paste porcelain. The decorations of the sets laid out in this room include typical fruit reliefs and flowering vines which, on one hand, are influenced by the models of Meissen and Sèvres and, on the other, have decidedly original elements, such as the delicate ornaments of wild roses, tulips and daisies with highly refined colour nuances. 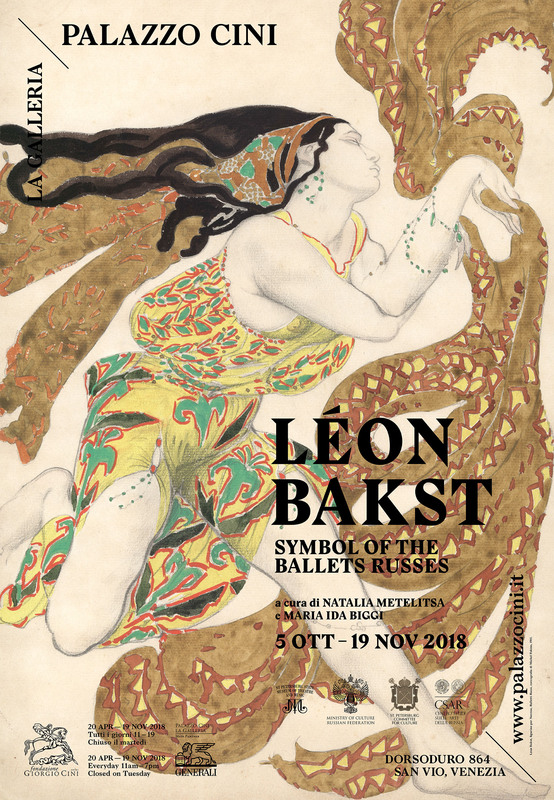 The exhibition, curated by Natalia Metelitsa e Maria Ida Biggi, explores the career of the renowned Russian artist and set and costume designer, who made a reputation thanks to his innovative creations for Sergei Diaghilev’s celebrated ballet company. 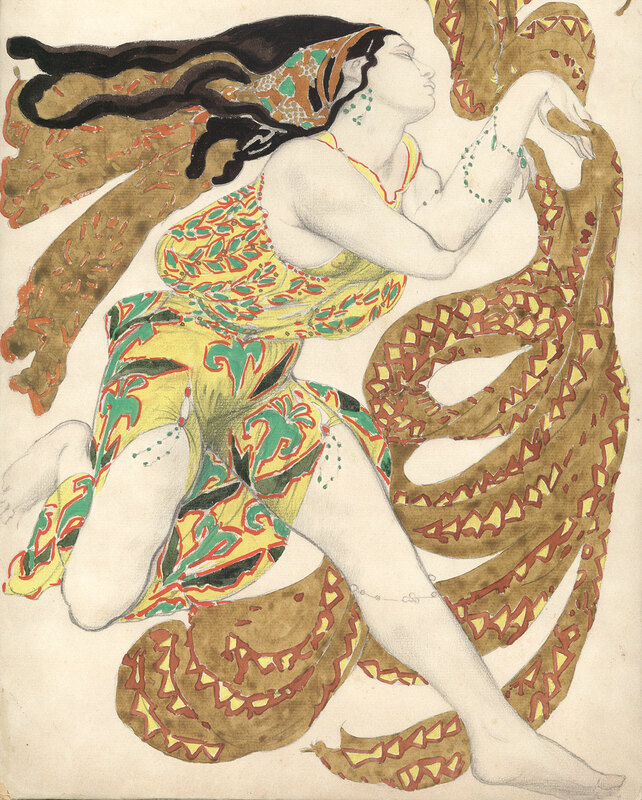 The result of a joint project by the Cini Institute of Theatre and Opera and the St. Petersburg State Museum of Theatre and Music, which has the largest collection in the world of Bakst’s set and costume designs, the exhibition is being staged in collaboration with the Centre for Studies on the Arts of Russia (CSAR) at Ca’Foscari University, Venice and is part of the “Russian Season in Italy”, organised by the Russian Ministry of Culture. The exhibition itinerary documents a large part of Bakst’s artistic production: after some little-known early works for productions such as Marius Petipa’s Le Coeur de la Marquise (1902) and some Greek tragedies (Euripides’ Hippolyte and Sophocles’ Oedipus at Colonna and Antigone; 1902-1904), the heart of the exhibition features the celebrated creations for the Ballets Russes, including those for Cléopâtre(1909), L’oiseau de feu (1910), Carnaval (1910), Narcisse (1911), Le Dieu bleu (1912), and Daphnis et Chloé (1912). In addition to these materials, there is a selection of costume designs mainly created between 1910 and 1911 for ballets such as Thaïs, La Traviata, Faust, Martyre de St. Sébastien and Manon Lescaut. The exhibition is completed by a rich series of photographs and original costumes, a fundamental aid in reconstructing the much-acclaimed artist’s multifaceted activities. Léon Bakst (1866-1924) was educated in St.Petersburg and Paris. With Sergei Diaghilev and Alexandre Benois, he founded Mir iskusstva, the magazine in which he published his first graphic art works. In 1902, he began working as a set and costume designer for the St. Petersburg imperial theatres. Albeit with rifts and reconciliations, his collaboration with the Ballets Russes lasted from 1909 almost throughout his career. 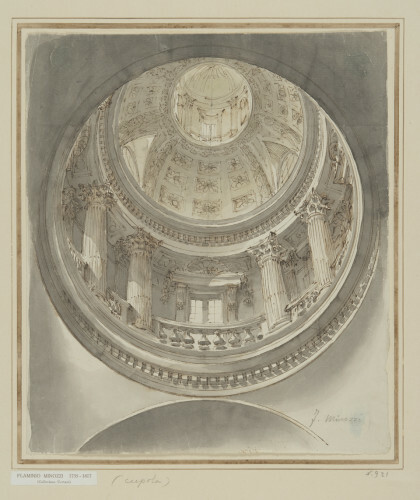 IMAGINED ARCHITECTURE DRAWINGS FROM THE FONDAZIONE GIORGIO CINI COLLECTIONS The Galleria di Palazzo Cini opens the 2018 season by dedicating its second floor to the exhibition of a nucleus of drawings from the collection of the composer and cellist Antonio Certani: a collection of more than 5000 sheets, most of which relate to the genre of painted architecture. 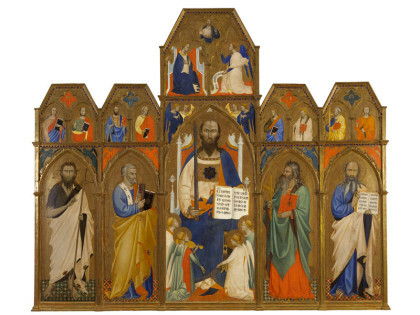 The exhibition, curated by Luca Massimo Barbero and the Istituto di Storia dell’Arte, arises out of the wish to return to the Palazzo Cini visitors, in the year of the Architectural Biennale, a part of the numerous drawings for illusive architecture, scenery and ornamentation that make up the collection. Sketches, plans and study copies make up a dense weft that immerses the visitor in a pathway that gives the architectural drawing a central place as ideational and design moment. From quadrature for walls and ceilings, to temporary apparatus for the rites of the community and of power, from architecture for the stage to designs for ornamentation and the decorative arts, to end with some examples of drawings for ‘real’ architecture: the result is a plunge into the genre of architectural illusionism, a combination of optical-geometrical expertise and mimesis of the pictorial ars. This exhibition is a key part of the series of events aimed at reviving interest in the actress Lyda Borelli (1887-1959). Entitled Lyda Borelli: A Leading Lady of the 20th Century, the show has been curated by Maria Ida Biggi, the director of the Fondazione Cini Institute of Theatre and Opera, and installed in the elegant setting of the house-museum of the Palazzo Cini at San Vio, now open again thanks to a partnership with Assicurazioni Generali. Through a remarkable series of photographs and rare archive documents, the exhibition tells the story of one of the most fascinating Italian stars of the early 20th century, her great achievements on the stage in Italy and worldwide, and her enormous success in cinema. Daughter of the actors Napoleone Borelli and Cesira Banti, Lyda was already often on the stage as child, and she officially debuted alongside Virginia Reiter in 1901. 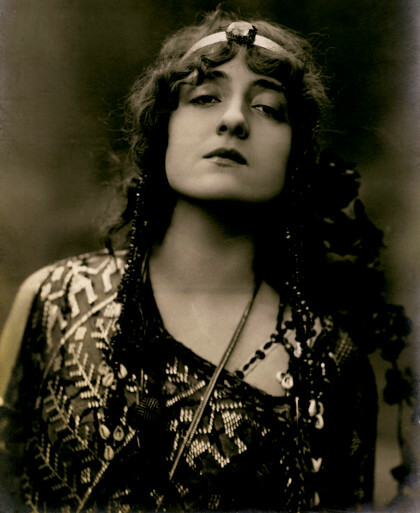 In 1903, she joined Virgilio Talli’s company and, until she retired in 1918, she worked with the greatest actors of the day and was the greatly acclaimed leading lady in plays by writers such as Gabriele D’Annunzio, Oscar Wilde and Sem Benelli. Her image as a theatre actress paved the way to her status as an Art Nouveau icon of style and gracefulness created by her subsequent film roles that were enormously popular with wider audiences. The exhibition project, organised in agreement with Lyda Borelli’s heirs, has been produced in collaboration with institutions such as the SIAE-Biblioteca e Raccolta Teatrale del Burcardo, Rome; Fratelli Alinari. 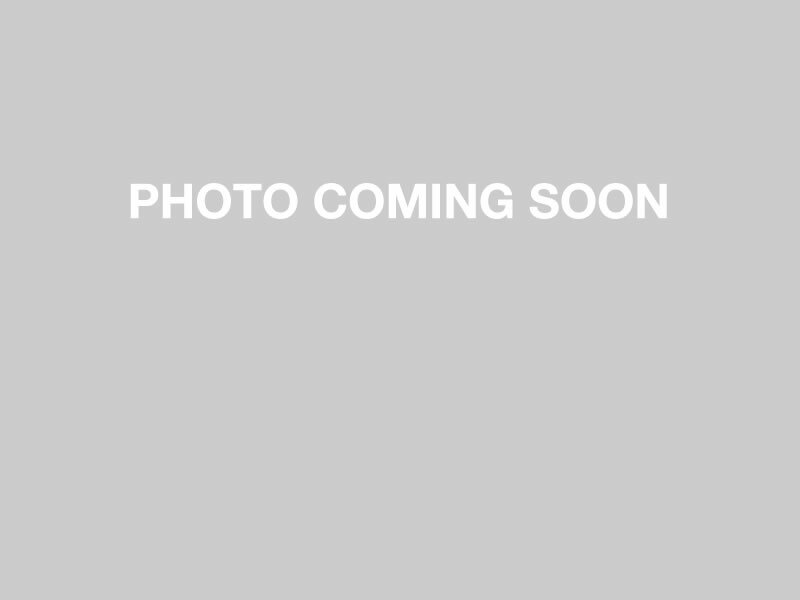 Fondazione per la Storia della Fotografia, Florence; ICCD – Istituto Centrale per il Catalogo e la Documentazione, Rome; Biblioteca e Archivio storico di Casa Lyda Borelli, Bologna; and the Fondazione Cineteca Italiana, Milan. History director, Luca Massimo Barbero. Staged in collaboration with Ben Brown Fine Arts, London, the exhibition features photographs and a glass sculpture produced by the artist in a process involving the re-elaboration in a personal key of familiar works in the collective imagination. 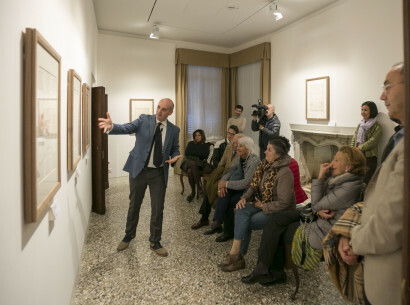 In this case he has been inspired by paintings in the great Venice lagoon tradition, and he has reinterpreted works actually shown at San Vio during the 2016 exhibition entitled Rediscovered Masterpieces from the Vittorio Cini Collection, as well as some works permanently on show in the historic collection. He will thus also forge a link between the first and the second floors in the gallery. 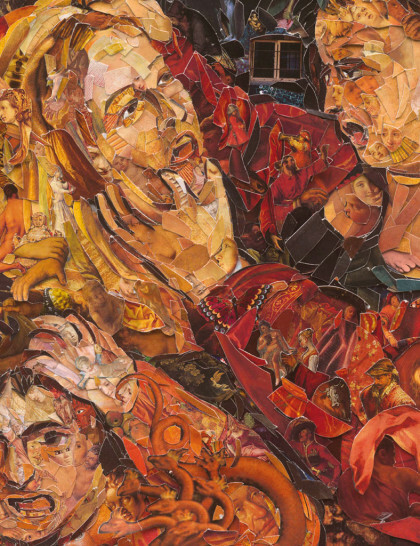 Muniz simulates the brushstrokes of the celebrated paintings by using cuttings of illustrations reproduced in art books. He carefully selects not only the colour values but also the images: glued together they produce the tactile, physical effect of an impastoed surface. In the wake of the tradition of the 17th- and 18th-century artists, Muniz ingeniously recombines various elements to reconstruct images that appeal to the visual subconscious and invite viewers to explore further. 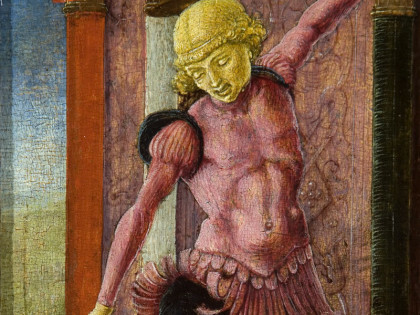 Rediscovered Masterpieces from the Vittorio Cini Collection is a unique opportunity for both the general public and scholars to explore a significant and lesser-known part of the extraordinary collection put together by Vittorio Cini. Visitors will be able to admire the Group of Veneto paintings, some exceptionally on show to the public for the first time, which give an idea of the qualitative standards of one of the most important art collections in 20th-century Italy. Although starting froma predilection shaped by Berenson, in keeping with the principles and trends of the time for the art of the Italian Primitives andthe Renaissance (from Guglielmo Veneziano to Carlo Crivelli, Jacopo Bellini and Bartolomeo Montagna), the exhibition highlights how Vittorio CIni also took an interest in later centuries, from the 16th century of Titian and Lorenzo Lotto to the 18th century of Giambattista Tiepolo, Canaletto and the Guardi. A work deserving a special place on this itinerary of Veneto paintings is Titian’s enigmatic Saint George Slaying the Dragon. An intriguing and problematic work for its history, critical interpretation and attribution, it was probably a panel of an altarpiece commissioned from Titian by the Venetian Republic in the second decade of the 16th century. In the nineteenth century the work was attributed to Giorgione while in the early decades of the 20th century it was assigned first to Palma Vecchio and then to Giorgione again. 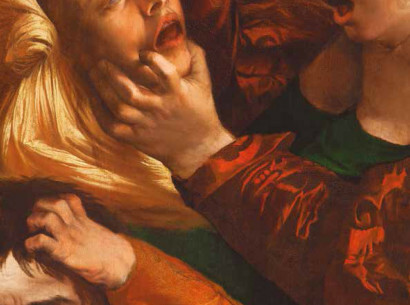 It has only recently been firmly attributed to the great Titian. Four sublime Capricci by Francesco Guardi and two small bozzetti for altarpieces by Giambattista Tiepolo will be on show in dialogue with the works by Canaletto. Together with two of Antonio Guardi’s celebrated turcherie (Turkish-inspired interiors), three of his albums of drawings will also be presented for the first time. Known as the Fasti veneziani, the fifty-eight sheets illustrate events and festivities in the history of Venice. The graphic works are of a remarkably high standard and characterised by a style that reflects Guardi’s Rococo vein. 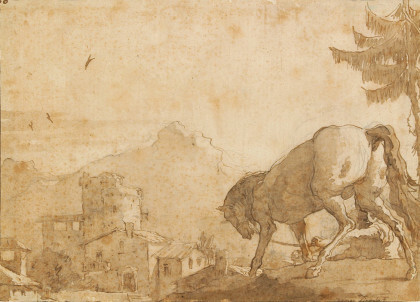 To promote and make better known the wealth and value of its graphic art collections, the Fondazione Cini Institute of Art History is also showing a rich selection of 18th-century Veneto drawings from the Fondazione Cini Drawings and Prints Cabinet, again on the second floor of the Palazzo Cini, until 15 November 2015. The fascinating itinerary includes splendid works by Canaletto, Guardi, Giambattista and Giandomenico Tiepolo, Giambattista Piazzetta, Ludovico Dorigny, Antonio Pellegrini, Giambattista Pittoni, Giuseppe Zais and Bernardino Bison. 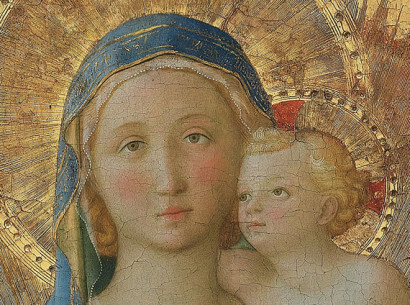 Most of the drawings were previously in the Fiocco and Fissore Pozzi collections. The exhibition will also feature a large watercolour View of San Giorgio Maggiore, attributed to Francesco Guardi, and a selection of portraits depicting the variegated world of 18th-century Venice from the album of caricatures by Anton Maria Zanetti, gifted to the Foundation by Vittorio Cini in 1968. A further attraction in the drawings exhibition is a marvellous gouache by Francesco Guardi, depicting a striking architectural capriccio (c. 1760). 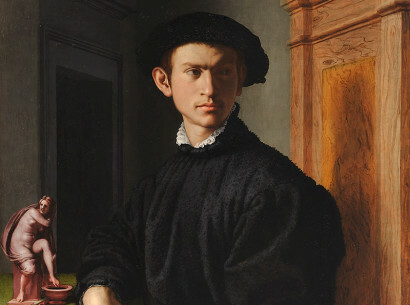 The work has been lent by the Musée Jacquemart-André di Parigi in exchange for the loan of Pontormo’s Portrait of Two Friends from the Cini Gallery for an exhibition on 16th-century Florentine portraiture (Florence. Portraits à la cour des Médicis, Musée Jacquemart-André, Paris; 11 September 2015-25 January 2016). In mid-16th-century Venice, when the sumptuous patrician palaces were being filled with rich art collections, Roman antiquities and painted decorations, Daniele Barbaro led a systematic renewal in the world of knowledge (languages, techniques, sciences and arts). A major cultural figure of the day, responsible for Venetian re-editions of Vitruvius’ De Architectura, he established a new humanist and scientific outlook in the ars edificatoria (the art of building). 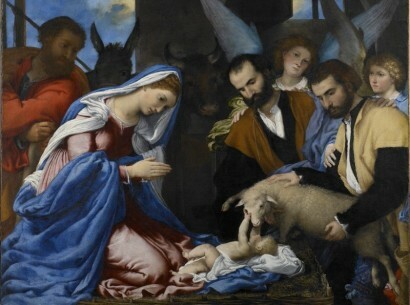 As part of the celebrations for the 500th anniversary of the birth of Barbaro, promoted by the Veneto Region and the Fondazioni Giorgio Cini, the salone on the second floor of the Palazzo Cini – in concomitance with the exhibition of 18th-century Veneto drawings from the Cini collections – will host two unrivalled masterpieces of 16th-century Venetian portraiture: paintings of Barbaro by Titian and Paolo Veronese, exceptionally loaned from the Museo del Prado, Madrid, and the Rijksmuseum, Amsterdam, and on show together for the first time. The painting by Titian portrays Barbaro in a three-quarter pose, aged about thirty, with the introspective gaze of a scholar (c. 1545). 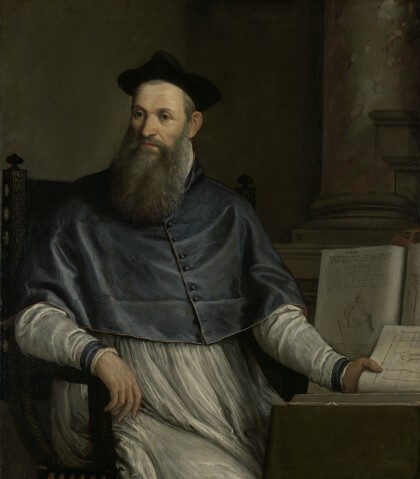 Veronese’s portrait from the Rijksmuseum, Amsterdam, on the other hand, depicts him as an older man (1560-61), dressed in clerical vestments (in 1550 he had been made Patriarch of Aquileia). To complement the event, the Fondazione Cini Institute of Art History has organised a day of lectures on Daniele Barbaro and his cultural context to be given by leading experts in the field on 4 November 2015. Assicurazioni Generali fully identifies with the commitment to support and hand down to the next generation our inestimable cultural heritage. 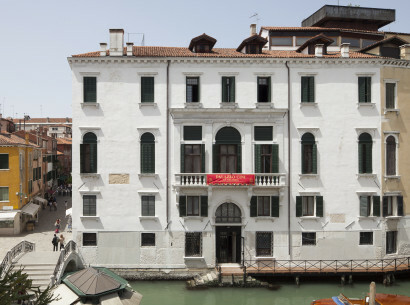 The reopening of the Palazzo Cini at San Vio is an example of this and has a hallmark value for the company as it continues to pursue its centuries-old mission of caring for things of value. 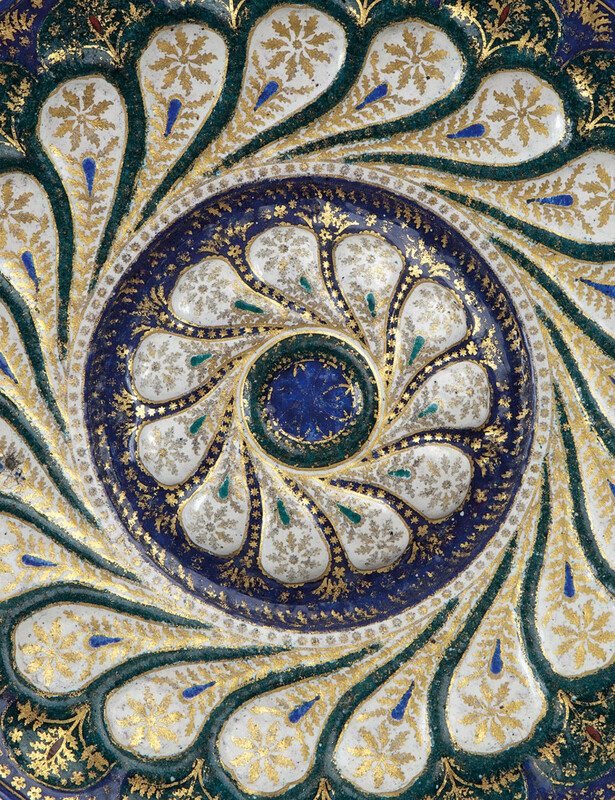 By opening to the public on a lasting basis such a rare and precious legacy as the Palazzo Cini, Generali wishes to offer the opportunity for people to discover, become familiar with and cherish its fascinating treasure, consisting of the gallery, furnishings and art objects. They reflect the original character of the great collector Vittorio Cini’s home and personal taste. We are thus also afforded a look behind the wings of the Cini Foundation’s farsighted culture operation on the island of San Giorgio, now celebrating its sixtieth anniversary. Through its supporting actions, Generali interprets its role as a patron of the arts in an innovative way by enabling projects to be implemented and by providing new opportunities for exchanges with the public as well as creating value and stimuli. All this is done by communicating in the unique, instantly recognisable language that is the Group’s distinctive feature in the over sixty countries in which it operates. Generali’s commitment to Venice is highly meaningful. The Lion of Saint Mark is an indelible symbolic link with the lagoon city and its history. 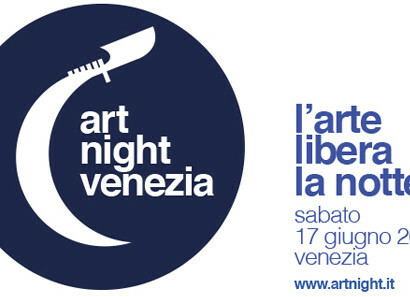 Since its foundation, the company has been present in Venice and shares the same multicultural international tradition while supporting the city’s principal artistic, musical and literary institutions. By emphasising the promotion and diffusion of culture, Generali demonstrates its conviction that bringing people into contact with art, music and literature is a crucial factor in personal development and stimulates innovation.